Travis Miguel from Atreyu teaches this song from Congregation of the Damned. Travis Miguel of Atreyu teaches songs from the band. Learn this amazing Atreyu song from Congregation Of The Damned. Atreyu guitarist Travis Miguel teaches "You Were King, Now You're Unconscious"
Atreyu guitarist Travis Miguel teaches this anthemic song from Congregation Of The Damned. Travis Miguel from Atreyu teaches this song from the album of the same name. 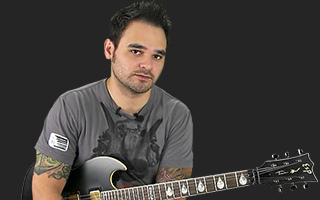 Travis Miguel from Atreyu teaches this popular song from Lead Sails Paper Anchor. Travis Miguel is one of the founding members of the heavy metal band Atreyu and current member of the band Trapt.